A number of high-level Nigerian officials are believed to have been on board. LAGOS, Nigeria (CNN) -- The wreckage of a passenger jet with 114 people on board has been found in central Nigeria, authorities said. Bellview Airlines Flight 210 disappeared from radar shortly after taking off from the commercial capital of Lagos en route to the political capital Abuja. The Boeing 737 left Murtala Muhammed airport at 7 p.m. (2 p.m. ET) Saturday for what should have been a 50-minute flight. The pilot issued a distress call just before the control tower lost sight of the plane about three minutes after takeoff, officials said. Bellview is a Nigerian airline popular with expatriates living in the West African nation, and Western diplomats feared several of their citizens could have been on board, Reuters reported. The airline has been operating for about 10 years and has no record of any incidents. The Federal Airports Authority of Nigeria said earlier that two helicopters had been scrambled to search for the plane. Relatives of those on board also chartered a helicopter to look for the plane, while teams were dispatched to search on land and in the water. A statement from Bellview Airlines read earlier on Nigerian television said the airline was "not able to confirm the whereabouts of the aircraft." The twin-engine plane had a capacity of 120 people; there were 108 passengers and 6 crew aboard. 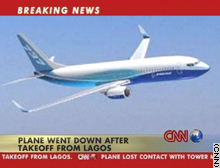 A storm was passing through Lagos about the time the flight left, according to CNN's Jeff Koinange. There were widespread rains and thunderstorms around the southwestern corner of Nigeria, particularly near Lagos to Ibadan, said CNN's meteorologist Mari Ramos. Boeing spokeswoman Liz Verdie said the company would work with the U.S. National Transportation Safety Board if invited to do so. The normally bustling airport in Lagos was quiet on Sunday morning as rescue efforts were under way, Koinange said.